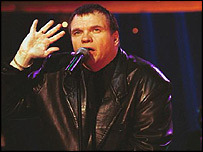 The singer Meat Loaf has spoken for the first time about his collapse on stage during a concert at Wembley. He has a condition which causes an irregular heartbeat and said doctors had told him he was lucky to be alive. "I remember not being able to sing the lyrics for the song All Revved Up, walking over to where the girls were and starting to fall," he said. "Then I don't remember anything until everybody's all around me and I said, 'Where's my mike? Let's go,'" he joked. The 52-year-old singer, who has been diagnosed with Wolff-Parkinson-White Syndrome, was initially treated at Northwick Park Hospital in Harrow, north-west London, after the collapse on 17 November. "The healthcare was spectacular. This was not a private hospital and I was there for more than 24 hours," he said. "I've been in hospitals in America where they slap you and say 'you're ok'." Meat Loaf then had an operation to correct the defect at the private Wellington Hospital in St John's Wood. The Wembley Arena show and a number of other dates on his tour have been rescheduled. But his concert in Manchester on Sunday has been postponed after a medical specialist advised the singer not to perform until later in the week. A spokesman for the M.E.N. Arena said they were confident of rescheduling for the middle of January and tickets for Sunday's show would still be valid.